Summary: When BFFs Charlie, Taylor and Jamie go to SupaCon, they know it’s going to be a blast. What they don’t expect is for it to change their lives forever. Charlie likes to stand out. SupaCon is her chance to show fans she’s over her public breakup with co-star, Reese Ryan. When Alyssa Huntington arrives as a surprise guest, it seems Charlie’s long-time crush on her isn’t as one-sided as she thought. 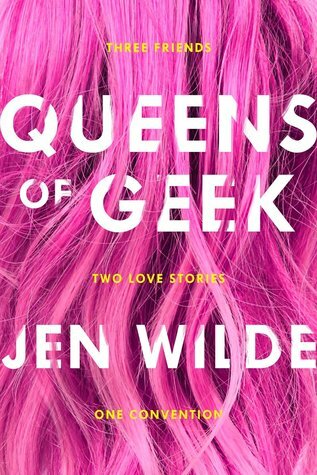 Review: I was immediately sold on Queens of Geek, just by the blurb. While I’ve never thrown myself into a fandom, I find discussions of fandom culture – whether in fiction or in meta posts online – fascinating. In that sense, Queens of Geek was right up my alley. The book follows two best friends, Charlie and Taylor as they attend the convention SupaCon for the very first time, with third BFF Jamie in tow. Vlogging star Charlie Liang is still dealing with the fallout from her celebrity breakup with her indie-movie-turned-sensation co-star Reese — all while falling for fellow superstar Alyssa Huntington. Meanwhile, her best friend Taylor is busy chronicling her SupaCon experiences on Tumblr and coming to terms with her crush on her friend Jamie. The identities and topics included in Queens of Geek – bisexuality, mental health, body image, sexism, fandom culture, and more – are smoothly incorporated into the book. As I’m not super familiar with fandom culture and other aspects of the book, I’m looking forward to what other, more knowledgeable, readers think of how things are handled in the book. In general, I had tons of fun reading Queens of Geek, and there were quite a few swoonworthy (yep, sorry, I’m using that word now) moments. If you’re into fandom culture, or just reading about it, then definitely check Queens of Geek out.